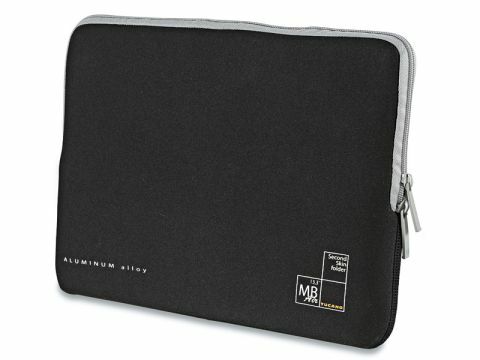 We see many different brands of neoprene sleeves like this Second Skin for the MacBook Air by Tucano. Perhaps there's a scuba suit factory somewhere that saw a trick servicing the rapidly expanding Mac laptop market. There's not much to this kind of design; the material is the same used on diver suits. It's fairly tough, certainly enough to take minor scrapes and keep your beloved Mac scratch free. It has a cushioning quality and wraps around the computer to make a snug fit, but it doesn't protect from more significant impacts. Because these sleeves are easy to find and relatively identical from different makers, the things to look for are price and the quality of the stitching and zip. This Tucano sleeve is priced well and also served us well. Tucano's microfibre sleeves feel nicer to us, but this neoprene will suffice. The Apple Store carries both if you want to compare, though Amazon is cheaper.